This piece was turned within six months after attending John Jordan's class on hollow forms and is probably the best I produced during this time. It is certainly the largest, starting out with a two-foot-long birch log weighing 185 pounds which had to be reduced in diameter to fit my lathe's 18-inch throw. Despite the rather large size the finished piece only weighed about 4 pounds which shows how much wood was removed in the turning and hollowing process. 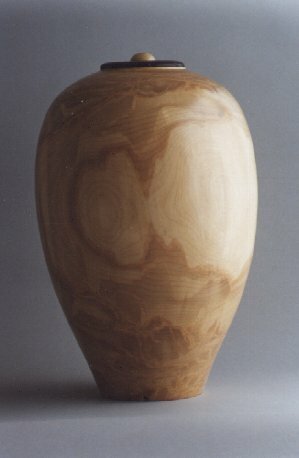 The depth of the turning required that I make special tools to reach the bottom when hollowing. This piece won best in class at the the 1997 Fur Rendesvous Juried Crafts Show and sold for more than any other piece I have done. Despite the money I'd rather have the piece back to enjoy myself. The lid is made of gaboon ebony with a cabochon of tagua nut set into it. Body finish is with sprayed artist's matte fixative lacquer while the lid is friction polished. Approximate size in inches: 13 X 18.